Local redevelopment organization OTR A.D.O.P.T. has begun rehabbing the church at 1815 Freeman Ave. 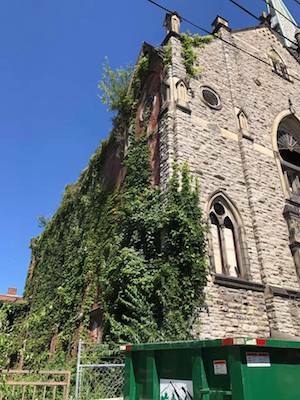 It's been vacant for over 30 years, and the hope is that it will become the first climbing gym in the city of Cincinnati. On Saturday, volunteers gathered at the church to clear out the trash and begin basic refurbishment work. 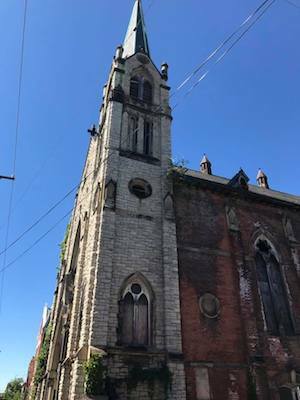 The church at 1815 Freeman Ave. could become Cincinnati's first climbing gym. Constructed in the 1880s, the intricate structure has sat vacant since the 1970s, and was filled with trash with graffiti covering the walls. OTR A.D.O.P.T has been involved with the church building for about five years, but the project is just getting to the beginning stages. Brenden Regan, project manager for OTR A.D.O.P.T. says, "If it’s going to be anything, it’s got to be watertight. The main goal is to get the building stable, dry and secure by winter." The development is in the very early stages, and the climbing gym concept is still young. The gym is the first viable offer OTR A.D.O.P.T. has received. Other options included a music venue and doctor’s office, but the stakeholders were unable to pursue the project. A big room with 30-foot ceilings is a difficult space to work with. But a climbing gym could be just the right match for the historic building. Church exteriorOTR A.D.O.P.T is a nonprofit organization that looks to historic buildings that have long been empty and ignored. To save these dilapidated structures, it takes notice of and fixes them up in the hopes that they will be more attractive to a buyer. According to its website, OTR A.D.O.P.T. matches "deteriorating historic buildings in Cincinnati’s core neighborhoods with new owners." Right now, the organization is working with around 10 properties. And contrary to its name, OTR A.D.O.P.T. is branching outside of Over-the-Rhine, and has worked in a number of developing neighborhoods, including Covington, Mt. Auburn, Camp Washington and Walnut Hills. As for the West End? "It has a lot of great buildings that deserve to be fixed up," Regan says.